The US Environmental Protection Agency (EPA) released its official fuel economy rating for the new 2017 Hyundai Ioniq Electric, the Korean automaker’s first all-electric car, and it took the first spot as the most efficient car rated by the agency – dethroning the BMW i3. With an EPA-rated range of 124 miles on only a 28 kWh battery pack, the vehicle outperforms any other EV. The official MPGe equivalent is 150 in city driving and 112 for highway – for a combined city/highway of 136. 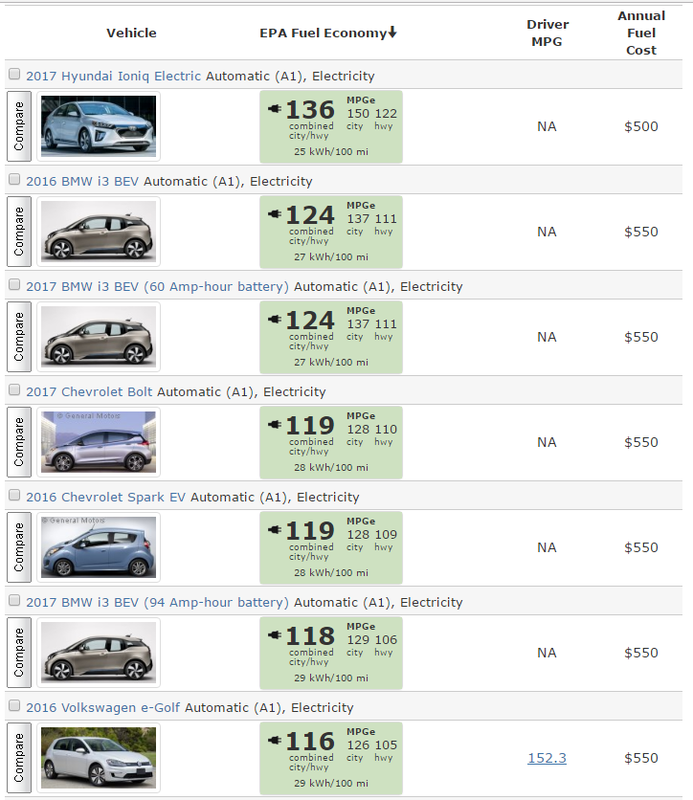 To be fair, not all 2017 version of the electric vehicles have been tested yet, but it’s also not like the Ioniq Electric is the first one and considering it has a significant lead over the second best (136 vs 124 for the 2017 BMW i3), it’s not likely to be dethroned for a while. The vehicle, which has been on the market in Korea since the beginning of the year, arrived in Europe earlier this month and it is expected to go on sale in North America during the first quarter 2017. Pricing hasn’t been announced in the US yet, but it starts at £28,995 ($37,900 USD) in the UK – making the vehicle competitive with the Nissan LEAF, BMW i3 or VW e-Golf. It might be more difficult for the vehicle in the US since it will likely compete in markets where the Chevy Bolt EV will be available at roughly the same price, but twice the energy capacity and about 100 miles more range. But Hyundai appears to be committing to its new electric vehicle platform and it is planning to release 4 new electric vehicles by 2020, including potentially a 200+ miles range version of the Ioniq Electric.